These colorful giftbags are made of 100% polyester and have a matching silk drawstring ribbon. They can fit up to 5 scentastics' soaps! 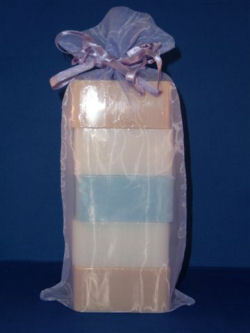 They could also fit our lotions, liquid soaps, foaming soaps, bubble bath, bath and shower gel and reed sets. Don't forget to put a soap sock in there too! Make your gift look extra special!